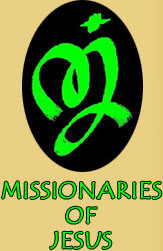 Missionaries of Jesus - Welcome! This weekend we will have with us Rev. Rey Tejico, representing the Missionaries of Jesus in a mission appeal. Rev. Rey Tejico was born in Iloilo, Philippines and was ordained in Guatemala, Central America on 23 September 1994. He worked with the displaced communities in the marginalized area of Guatemala City from 1991-2002. He then rendered services in the Philippines among the Aetas native communities in Rizal from 2002-2006. From June 2007 up to the present, he works with two members of the Missionaries of Jesus in the Apostolic Vicariate of Paten, Guatemala. The primary evangelization task is to bring personally the presence of Jesus in the 45 villages within our pastoral care, to announce the message of hope and to celebrate Life with the people as a Church and through the sacraments. Their website is found by clicking here. 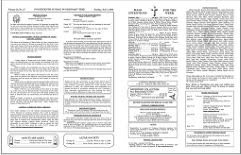 The bulletin for the weekend of August 02, 2009 has been posted. Click here to see it. Cemetery Tours are coming! October 10,11,17 & 18, 2009. Travel to a place where voices from the past will greet you as you journey back remembering the call to community service. The tours of the St. Landry Catholic Church Cemetery give one a perspective into how our past has shaped our present and influenced future generations of our community. Learn which families were here and what their lives were like, and what events helped to shape our present day history. 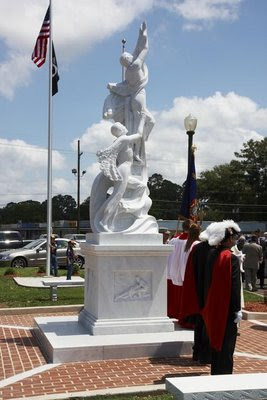 Opelousas, Louisiana’s third oldest city, founded in 1720, is comprised of many cultures, each with unique histories which should be shared. All proceeds from the cemetery tours fund the Cemetery Historical Restoration project. The tours began in 2003 and, so far, 20 grave sites have been restored. Standing under the massive cedar trees of St. Landry Catholic Church Cemetery, there is a calm that will transport you back in time to a place named Opelousas. From its beginnings as a Spanish Fort to the City of today, it has beckoned people from all ethnic groups to be part of its colorful history. Each person who has been a part of Opelousas and St. Landry Parish has left their mark. Epidemics such as Yellow Fever and Typhus claimed many families and this cemetery, consecrated in 1798, reminds you of the lives that were lost. For nine months during the Civil War, Opelousas was Capitol of Louisiana. In fact, when Union Soldiers occupied the town they even camped out on the church grounds. As with wars before and after the Civil War, here you will find soldiers who fought in every war for what they believed in and the families that remained at home. They helped to create a foundation rich in its culture and traditions, one that Opelousas is proud of. We invite you to experience it all. 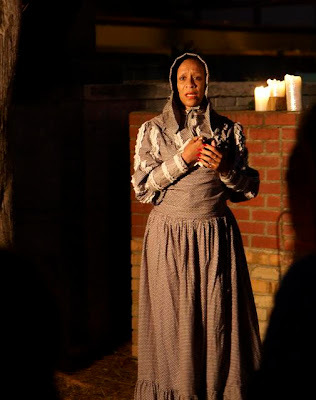 Spend some time with the voices from our past and listen to their stories. Some are happy while some are sad and others will leave you wanting more. You will be amazed at what they are willing to share about their live and the struggles they endured. Time and Mother Nature have taken their toll on some of the graves in this cemetery. Many buried here are lost forever but those that do remain await your visit. You’re always welcome beneath the cedars. 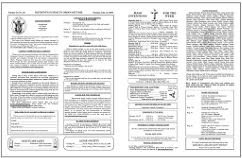 Information Available at office below or click here to download brochure. Click here for information at parish website. Not handicap accessible. Not suitable for children 10 years of age or under. Today is the Feast of St. Joachim and St. Anne, the parents of the Virgin Mary. Although they aren't named within the gospels, early writings after the time of the Apostles referred to them by these names. Many of the stories written about them claim they were childless until St. Anne became pregnant late in life. 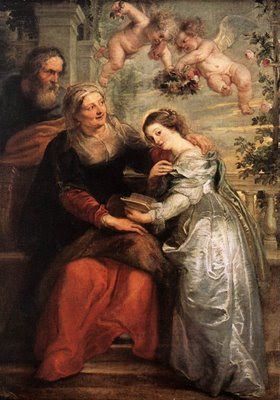 In art, St. Anne is often depicted helping with Mary's education and, in many cases, is shown teaching her to read. They are the patron saints of grandparents as they were the maternal grandparents of Christ. The current week's homily is available on a link on the front page of the website next to the link for the current week's bulletin. On the page with the prior bulletins, the corresponding homily will be sitting side by side with its bulletin. We started on the anniversary of the start of the Catholic Church, Pentecost Sunday. This week, The Seventeenth Sunday in Ordinary Time, is our ninth homily to be posted. This week, the homily is given by Monsignor J. Robert Romero. So, take a listen and let us know what you think. Click here to download the Seventeenth Sunday in Ordinary Time homily. Today is the Feast of St. James the Greater, one of the apostles. He was the brother of St. John, a son of Zebedee and Salome. Jesus called St. James and St. John "Sons of Thunder", something that may have referred to their fiery personalities. St. James was one of a handful of the apostles who were witnesses to nearly all of the greatest events of the New Testament including the raising of Jairus' daughter, the agony in the garden of Gethsemani, and the Transfiguration. 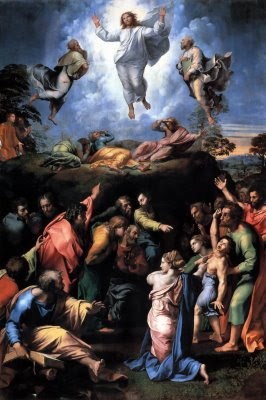 The painting of the Transfiguration above is by Raphael. In the Acts of the Apostles, we find that St. James was one of the earliest martyrs. Live in a manner worthy of the calling you have received. Jesus feeds the multitude with five barley loaves and a few fish. Jesus generously provides and cares for us. Last Sunday we listened to the Gospel story of how Jesus was moved with pity for the crowds who were like sheep without a shepherd. In today’s gospel, the Lord again looks upon the enormous crowd that had followed him and performs the miracle of the loaves and fishes. As we marvel at the miracle recounted in today’s Gospel, let us remember that, as baptized Christians, we are called to feed the hungry. This is one of the ways that we become more and more like Christ, who fed the thousands with what seemed to be so little. Let us be open to the inspiration that comes from today’s scriptures. How do you share with others what you have? What do you have that you should be sharing with others? How can you use your possessions, your talents and your time for the good of others? In what ways do you generously provide for the needs of others who have little or nothing? 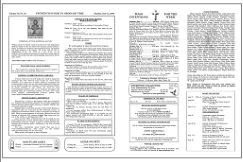 The bulletin for the weekend of July 26, 2009 has been posted. Click here to see it. Our prayers and condolences go out to Monsignor J. Robert Romero and his family. His mother, Mrs. Ruby G. Romero, passed away Saturday evening. ABBEVILLE - Funeral services will be held Wednesday, July 22, 2009, at a 10 a.m. Mass of Christian Burial, at St. Therese of the Child Jesus Church, honoring the life of Ruby Romero, 79, who died Saturday, July 18, 2009, at Abbeville General Hospital. She will be laid to rest at St. Paul Cemetery with Msgr. Joseph Robert Romero officiating the services. Pallbearers include; Kenneth Romero, Brent Romero, Mason Romero, Scott Romero, Darvey Dupuis and Randy Gaspard. She is survived by her husband, Joseph Robert Romero, Sr., of Abbeville; sons, Msgr. Joseph Robert Romero, Jr., of Opelousas, Kenneth Wayne Romero, of Lafayette, Michael Romero, of Pensacola, Fla., Brent Timothy Romero and wife, Dena, of Kaplan, and Mason Romero and wife, Liz, of Abbeville; a daughter, Bonnie Susan Romero, of Abbeville; a brother, Kallen Gaspard, of Lake Arthur; two sisters, Dorothy Snoddy, of Lafayette, and Gladys Dupuis, of Mouton Cove; seven grandchildren, Chrystal Desormeaux, Scott Romero, Abbi Cameron, Michelle Romero, Matthew Romero, Olivia Romero, and William Romero; two step grandchildren, Tiffany Luquette and Elena Pecoraro; five great grandchildren, Anthony Desormeaux, Renae Desormeaux, Elizabeth Romero, Isabella Pecoraro and Reese Cameron. 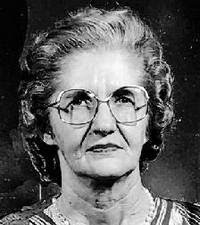 She was preceded in death by her parents, Gedeon and Anna Lege Gaspard; three brothers, Paul Leroy Gaspard, Clifton Gaspard and Weston Gaspard; and a sister Wilda Vaughn. The family requests that visiting hours be observed at Vincent Funeral Home -Abbeville, 209 S. St. Charles Street, on Tuesday, July 21, 2009, from 10 a.m. until 9 p.m. with a rosary to be prayed at 7 p.m. They will reopen Wednesday from 8 a.m. until time of services. Condolences may be sent to the family at www.vincent-abbeville.com. "Every high priest chosen from among men is appointed to act on behalf of men in relation to God" (Heb. 5:1). The current week's homily is available on a link on the front page of the website next to the link for the current week's bulletin. On the page with the prior bulletins, the corresponding homily will be sitting side by side with its bulletin. We started on the anniversary of the start of the Catholic Church, Pentecost Sunday. This week, The Sixteenth Sunday in Ordinary Time, is our eighth homily to be posted. This week, the homily is given by Monsignor J. Robert Romero. So, take a listen and let us know what you think. Click here to download the Sixteenth Sunday in Ordinary Time homily. God will gather the remnant of the flock and appoint shepherds to lead them. Jesus came to preach peace to all. Jesus was moved with pity when he saw the vast crowd, for they were like sheep without a shepherd. Sometimes we need to pause for rest with Jesus. Today’s Gospel passage is one of the most moving in all of scripture. Jesus looks out on the crowd and is moved with pity for them, for they “were like sheep without a shepherd.” Apparently sheep are not the brightest of God’s creatures and are in constant need of their shepherd. One might wonder what the attitude of Christ is today as he gazes on this world of ours. Is he moved to pity because we, too, are like sheep without a shepherd? Let us pray that God’s word proclaimed this day will inspire us to cling to the Good Shepherd and listen to his teachings. How do you keep Sunday a day of rest? Jesus was moved with pity for the people who were gathered. Who are the people you are moved with pity for? What can you do to help them? Why is rest important and how do you make sure you get enough of it in your own life? 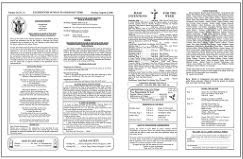 The bulletin for the weekend of July 12, 2009 has been posted. Click here to see it. 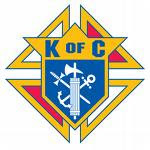 Council 1173 will be sponsoring a BBQ Po-Boy lunch with chips on Wednesday, 22 July 2009 from 10:30 am through 12:00 pm and will be available at the KC Hall at 917 N. Main St. or delivered. Donations are $5.00 each. For more information phone Deacon Miller at 942-2911. The current week's homily is available on a link on the front page of the website next to the link for the current week's bulletin. On the page with the prior bulletins, the corresponding homily will be sitting side by side with its bulletin. We started on the anniversary of the start of the Catholic Church, Pentecost Sunday. This week, The Fourteenth Sunday in Ordinary Time, is our sixth homily to be posted. This week, the homily is given by Monsignor J. Robert Romero. Welcome back from vacation, Monsignor! So, take a listen and let us know what you think. Click here to download the Fifteenth Sunday in Ordinary Time homily. 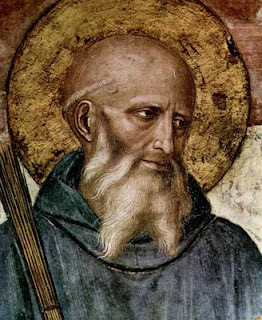 Today is the Feast of St. Benedict of Nursia, known as the Father of Western Monasticism. The Rule of St. Benedict, which he wrote, is a book of precepts that guide life within monastic communities. Written 1500 years ago, it is beautiful in its spirituality. The libraries and copying of texts by hand within Benedictan monasteries helped to preserve the accumulated knowledge of Europe. Click here to read The Rule of St. Benedict online. Just a few miles from St. Landry Catholic Church, a few miles outside of Plaisance, there is a community of Olivetan Benedictine Monks living within the Mother of the Redeemer Monastery. Abbot James Liprie and the other monks there celebrate the Feast of St. Benedict each year with a mass. It was well attended again this year. This weekend we welcome Monsignor Romero home from his vacation. We hope it was a very peaceful, relaxed one. God sends Amos to prophesy to the people of Israel. God chose us in Christ, before the foundation the world. Jesus sends the disciples out two by two to bring peace and preach repentance. Today we hear three stories about people being chosen by God: Amos the prophet, the Twelve, and all those who are baptized into Christ---which means us! Perhaps today’s scriptures are calling us to remember the call that was issued by God at the moment of our baptism. Listen to the words of St. Paul in today’s second reading to discover just what that call entails. Our world is still in desperate need of prophets and apostles. Peace and justice seem so elusive in our time. May today’s word of God inspire us to respond to God’s call to bring the gospel of salvation to those we meet in our every day lives. To whom would you announce the Good News about Jesus? Who do you think most needs to hear this message? When Jesus sent the disciples out, he was preparing them for the future when he would be gone. How are you growing in your own faith and preparing for a life as a Christian disciple? Why do you think Jesus sent them out two by two, rather than alone? Below is a word cloud from the web site Wordle. Word clouds allow you to analyze a text and illustrate the content by giving more prominence to words that appear frequently within the text. Click on the graphic to see it much larger. The words human, development, charity, truth, social and economic really jump out of the text. Today, the new social encyclical written by Pope Benedict XVI has been released. It is entitled Caritas in Veritate - Charity in Truth. The Holy Father has worked on this document for some time, reworking it to discuss the problems seen world wide with our economic melt down. It will soon be available at your local Catholic bookstore. In the mean time, the Vatican website has the full text posted. Click here to download a PDF version from our website. The current week's homily is available on a link on the front page of the website next to the link for the current week's bulletin. On the page with the prior bulletins, the corresponding homily will be sitting side by side with its bulletin. We started on the anniversary of the start of the Catholic Church, Pentecost Sunday. This week, The Fourteenth Sunday in Ordinary Time, is our sixth homily to be posted. 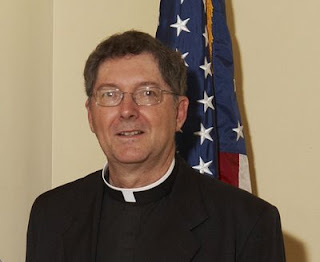 This week, the homily is given by Father Austin Leger. So, take a listen and let us know what you think. Click here to download the Fourteenth Sunday in Ordinary Time homily. Happy Fourth of July! Today, we remember the signing of the Declaration of Independence. Charles Carroll was of Irish Catholic descent and was the only Catholic signer of the Declaration of Independence. He was born in Annapolis, Maryland. After studying with Jesuits on his father's plantation as a child, his father sent him to France to study with the Jesuits at St. Omer's and later in Rheims. He ended his education there studying the law. As a Catholic in Maryland, he had been barred from entering politics, practicing law, and voting. Much of his work in favor of the Revolution consisted of writing to various newspapers as well as providing financial support from his sizable fortune. When Maryland decided to actively support the Revolution, he was elected to the Continental Congress. Later in life, he served as a U.S. Senator and was one of the founders of the B&O Railroad. 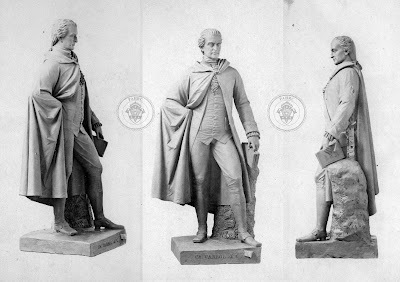 Carroll died in 1832 at the age of 95, revered by many across the nation as the last survivor of all the signers. East and West Carroll parishes in Louisiana are named after him. Carroll is remembered today within the state song "Maryland, My Maryland". He is known as Charles Carroll of Carrollton because that is the way he signed the Declaration of Independence. It's said that he added "of Carrollton" in order to differentiate himself from a cousin. All of the signers took great risks by affixing their names to the document. I am content with weakness for the sake of Christ. In today’s second reading we find that Saint Paul believed that it was through the boasting of his own weaknesses that the presence of Christ was made all the more powerful both within him and to those around him. Let us take the words of Saint Paul to heart this day. When we are tempted to groan or complain about our own “thorns in the flesh”, let us remember that it is in weakness that we are made strong. This is a central paradox of the Christian life, one that is difficult to live. May today’s scriptures strengthen our faith, even in our weakness. What helps you have deeper faith in Jesus? When have you struggled to speak the truth among your friends? What makes this difficult and what are the consequences? When have you placed your trust in God even though those around you did not believe? So the other disciples said to him, "We have seen the Lord." 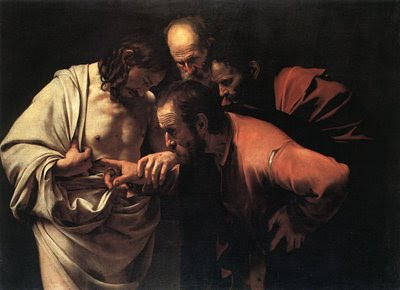 But he said to them, "Unless I see the mark of the nails in his hands and put my finger into the nailmarks and put my hand into his side, I will not believe." "Thomas, called Didymus, one of the Twelve, was not with them when Jesus came." Thomas' doubt comes in when he isn't within the rest of the Church community: when he was away and hiding. 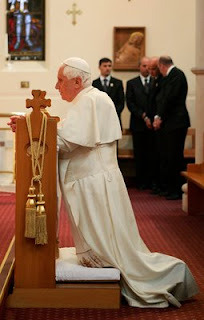 When he returns to join the other apostles within the Church, he believes and says one of the greatest prayers one can say, "My Lord and my God!". The lesson that we fully embrace Jesus by being part of the Church community is as important today as it was then. Pope Benedict's general prayer intention for July is: "That the Christians of the Middle East may live their faith in full freedom and be an instrument of peace and reconciliation". His mission intention is: "That the Church may be the seed and nucleus of a humanity reconciled and reunited in God's one and only family, thanks to the testimony of all the faithful in every country of the world". 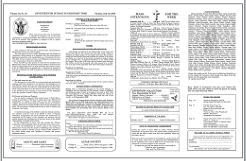 The bulletin for the weekend of July 05, 2009 has been posted. Click here to see it.